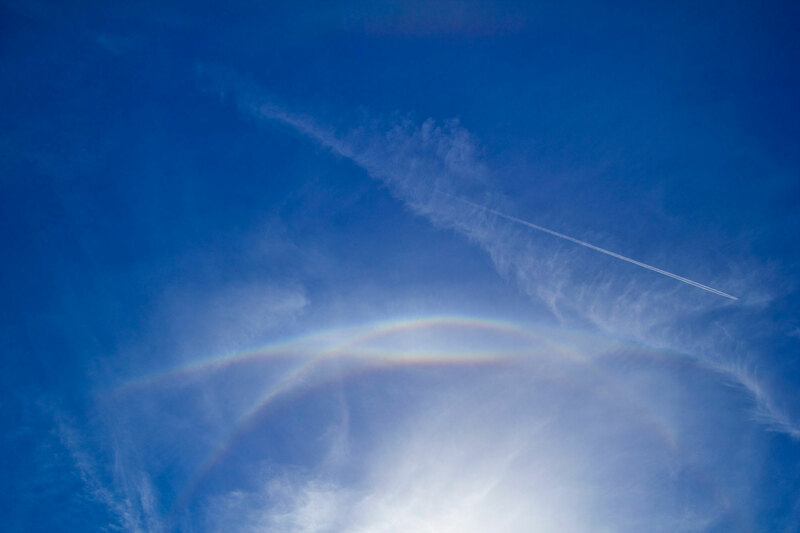 The types of halos and their brightness sometimes changed within minutes. The halo phenomena occured in the Sudelfeld, which is a mountain saddle at an altitude of ca. 1100 m. Low stratus clouds drawing in from the Inn River valley dissolved there and fell out in ice crystals. The Sudelfeld being a popular skiing resort, this morning two snow making machines ("snow guns") were also working, but shut off near 11 o'clock. Jari Luomanen suggests that the snow gun produced nucleation agents also took part in the nucleation process of the stratus which then continued even after the guns stopped operating. It's better to be inside a punch hole cloud than just look at it. On the night of 17/18 November snow guns seeded a punch hole in low stratus cover at Mustavaara ski resort in Eastern Finland. Plate crystal dominated halo display appeared in the resulting diamond dust. Temperature on the ground was -9° C. In the image above, moon elevation is 32.7°. 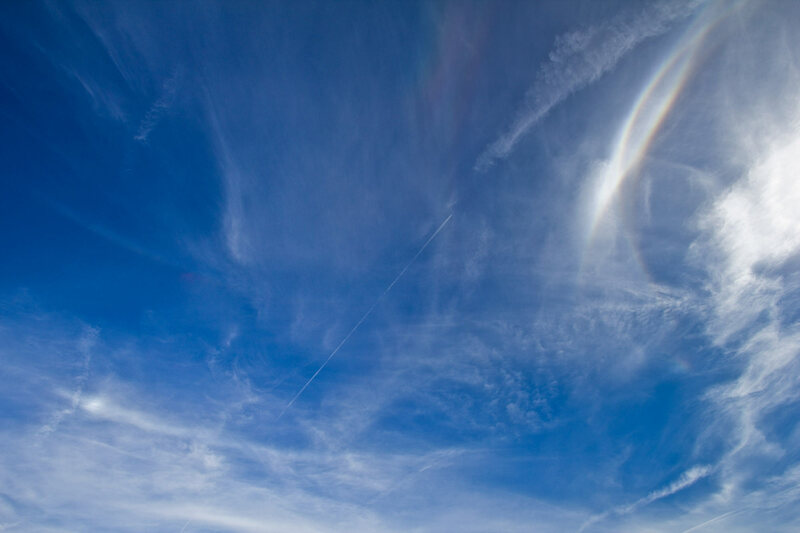 The display was seen at and/or just after high noon from eastern Nebraska about 41 degrees north, on November 7. My sister had called about some geese at a refuge nearby and wanted to go photograph them. I was going to visit my parents, like I often do, and decided I may as well take my camera gear with so if I went to the refuge I'd not have to stop back home. This is the only reason I even had photo gear with me. I stepped outside to do something, and right away saw the parhelic circle extending out a ways, something I've never seen before and I have at least seen a number of optics displays now (lunar fog bows, light pillars, lunar vivid coronas, etc)....so I look often enough for stuff. I pointed it out to my uncle as I sprinted for my car to get my gear and he thought, "it's not just a cloud". I said no, it's an arc, watch. I took my camera and sprinted up the hill behind the house. 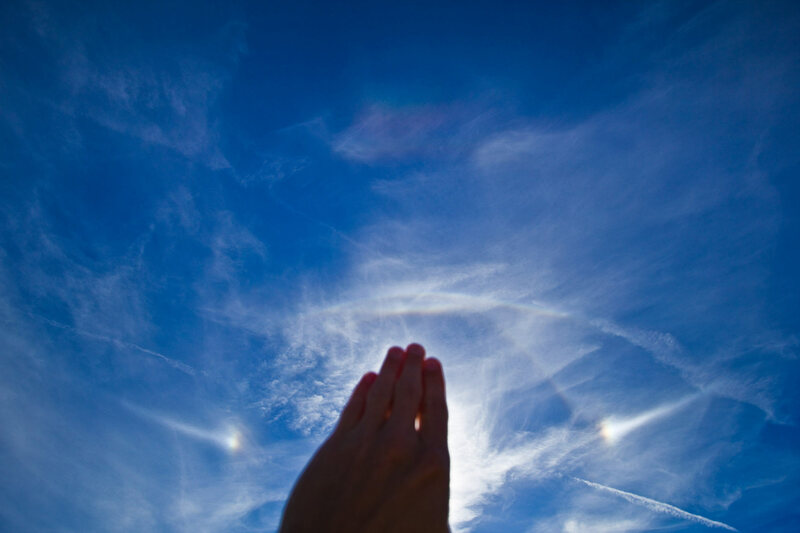 I soon was seeing "sun dogs" on the parhelic circle. 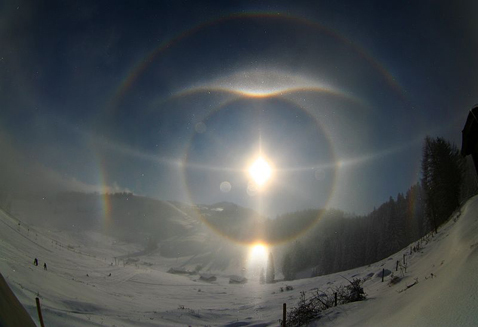 I then was clearly seeing the Wegener arc inside the parhelic circle. It was very vivid as with my eyes I could clearly see the rainbow colors. To be honest I never did see the Heliac arc before. I was flipping through pictures inside later and it simply jumped out. 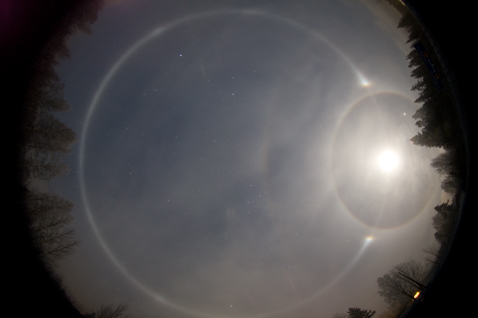 I was like, what is that arc..then looked it up. The show only lasted 30-40 minutes I'd guess. Then it was pretty hard to get any optics at all. What was strange was visually nothing much was changed about the sky. I was watching for hours so there were different periods of less contrail garbage blocking out the sun. I had friends in Omaha, 20 miles south, and Lincoln another 45 miles south of that, looking too. They never saw anything good. They watched till sunset too, but they also didn't get out as soon as I was and that was the best part. I wonder what I missed before I got out. The satellite loop for that day may give the key ( 6 ). I'm located in eastern NE which is at the top center. It was much like the crystals you get right behind a blizzard in air just where it is clearing behind the storm. 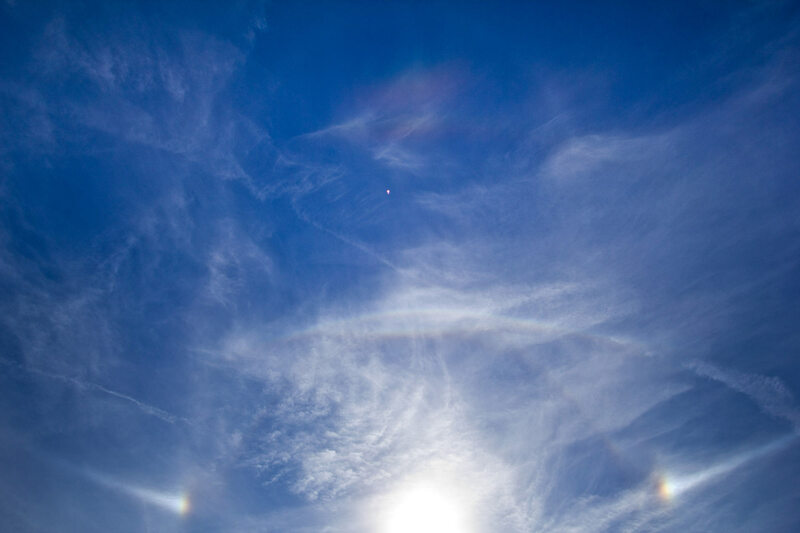 You can see a more puffy nature to the clouds, they pass and the ice crystals are left in the air. That stuff on satellite is below typical cirrus level/flight level...but still up there. 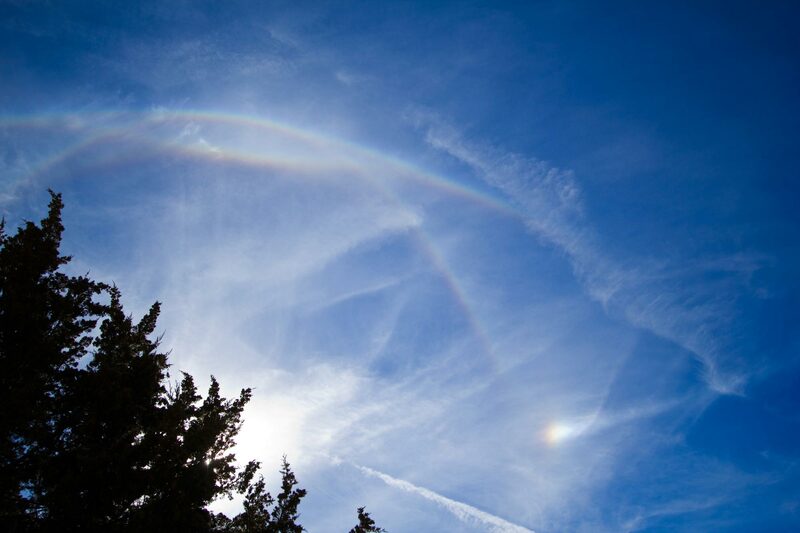 It for sure was different than normal cirrus. 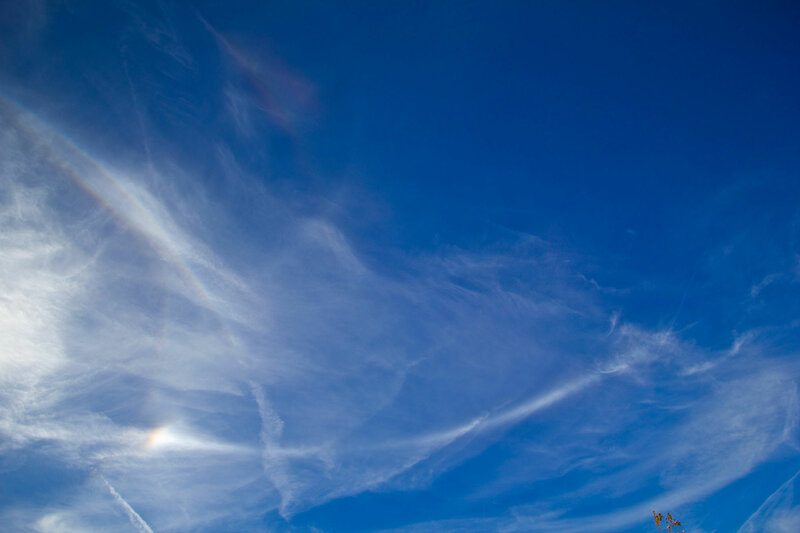 A lot of that "cirrus" in the shot is left over form all the contrails. Once the sun got lower you could see the moisture/clouds clearly below the contrails. So anyway, probably worth noting the clouds coming across at the time were more along the lines of mid-level clouds/moisture.